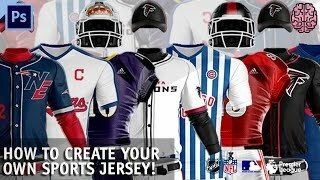 If you’re interested in creating jerseys, here is how I do it! Hey guys, I know the first thing that’s going to be said is about the price. Yes, the templates are pricey, but you’re paying for quality and there are other options if you don’t want to use these. I’m just recommending them to you. No this wasn’t a paid promotion, however I was asked to do a tutorial, and agreed since people ask me about this sort of stuff a lot. Anyways, ENJOY! Hi Qehzy i really like your vids thank you so much. i need your help with gradient tool. i’m trying to use it to gradient a flag. but i’m not able to do it. it removes the flag color and gives only the gradient color. how can i achieve this? actually i want the flag to look like the indians jerseys you did. not the same color, but the same texture. to understand what i mean it’s at the 22:30 mark of the vid. thank you so much. Hey bro, I need basketball,baseball and hockey jersey templates but without the bottoms. Please contact me as soon as you can — itsblais AT g m ail — I’ll contact you on your site too.